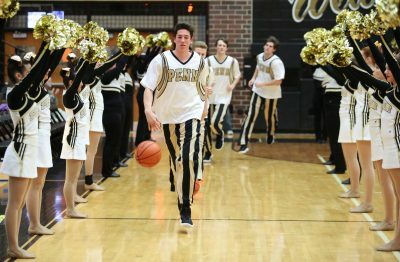 Noah Krathwohl is a 6-foot-4, 190-pound senior for the Penn Kingsmen basketball team. Entering his fourth and final year playing in Head Coach Al Rhodes’ system, Krathwohl has big plans for this team. Although he is the only senior on the team, Krathwohl does not believe experience is a problem for this bunch. “Most of the team is made up of juniors who have already had two years of varsity experience, so it’s not as hard as it may seem to be the only senior on the team,” Krathwohl said. Krathwohl averages 7.5 points and 3.7 rebounds a game. He has blocked nine shots. In order to get ready to make an impact for the Kingsmen this season, Krathwohl focused on getting in the weight room and improving individual skills on his own. During his time playing basketball at Penn, Krathwohl has had many role models and people that have helped him develop into the player he is today. One person is Point Guard Drew Lutz. Penn guard Beau Ludwick said that Krathwohl has been an outstanding leader for the Kingsmen. “Noah has been a great leader in the aspect that he knows when to let us have fun in the moment, but also get us ready when it comes game time or time to practice day in and day out,” Ludwick said. Krathwohl does not plan on playing basketball at the college level as he plans on either attending Indiana or Purdue in the fall of 2018 so he can focus on his education and getting the bigger college campus experience.